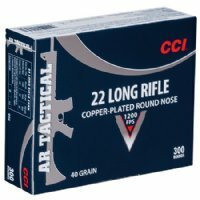 CCI AR Tactical .22 Long Rifle 40 Grain Copper Plated Round Nose AR Tactical Rimfire. Optimized for reliable function in AR-22 platforms. Affordable, high volume shooting round. Copper-plated target bullet offers superior accuracy.